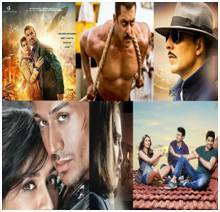 Here is the Recently updated list of Top 10 Bollywood highest grossing films of 2016 at Box Office collection in India. Bollywood Film industry is the 1st biggest film industry in worldwide after Hollywood. It produces hundreds of big budget movies every year. Here is the Recently updated list of Top 10 Bollywood 'Hindi' highest grossing Movies of 2016 at Box Office collection in India. Also Check Out: Top 10 Bollywood (Highest Grossing) Movies of All Time By Box Office Collection. Year 2015 release was biggest hit film like akshay kumar's Airlift, Sultan, MS Dhoni Untold Story, Rustom Etc.